I would like to be able to compute the distance between 2 hanzi according to their components. My idea is that a hanzi like 式 is made of 工 and 弋. 2 hanzi are close if they share common components. To be able to compute such distance, I need to be able to have a list of hanzi and their components in a digital format. Does such list exist? I know exactly the thing. There's a project on Wikimedia commons to document the substructure of characters in terms of other characters. I haven't spent much time with the data itself, so I can't tell you how complete it is, but it seems pretty good based on my experience with the Tatoeba character search tool that is based on the data. That tool allows you to "explode" characters into their components (e.g., 蝴 => 月虫...) or search for all characters with a particular component (e.g., 隹 => 倠傕傩...). Another project to do something similar is Wenlin's database of characters in the Character Description Language. Here is Wenlin's page of resources on the CDL. I'm not really sure if you have to buy Wenlin in order to get at some data. Anyhow, it looks pretty awesome. You can use Gavin Grover's CJK Decomposition data (used by HanziJS and cjklib). Check out hanzicraft.com & zhongwen.com; they have functions that seem similar to what you're asking for. You can looking for the hanzi in this page http://www.mdbg.net. Then search the hanzi, when you found it click it. Then you can click over the (1) scissors and show it! (2) After you can click over the components! 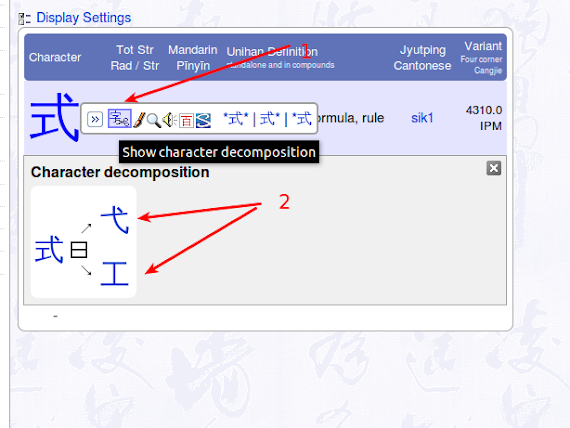 How does CJK Decomposition compare to the Wikimedia Commons Chinese characters decomposition data? How useful are the kanji in reading Chinese? Which characters typically occur only within names? Do all 汉字 components (radicals and non-radicals) have names? What do the character components in 旅 and 派 represent? Is there a database/application that sorts characters based on pronunciation, radical, frequency; and disyllabic compound words by frequency? Where can I find a list of chinese characters and their transcription in the 5 stroke classes used in the 五笔画 (wǔ bǐhuà) and Wubixing input method?